With spring here, many children, teens and adults will once again pick up the ball, bring the bat out of seasonal retirement, and lace up their cleats to hit the fields for the return of spring sports! April is National Facial Protection Month, and during this time, Dr. Roger Nettune, Dr. Kenneth Banasiak, and our dedicated team urge our young athletes to play it safe when out on the field. 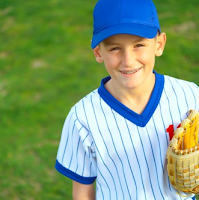 According to the National Youth Sports Safety Foundation, children, high-school athletes and adults will have more than 5,000,000 teeth knocked out in sporting events this year. 1. Wear mouth guards for contact sports such as baseball, softball, soccer and lacrosse. We hope that helps. Protective gear is vital for anyone engaging in tooth or mouth-threatening activities. If you have any further questions about any of these tips, please contact Banasiak & Nettune Orthodontic Associates.